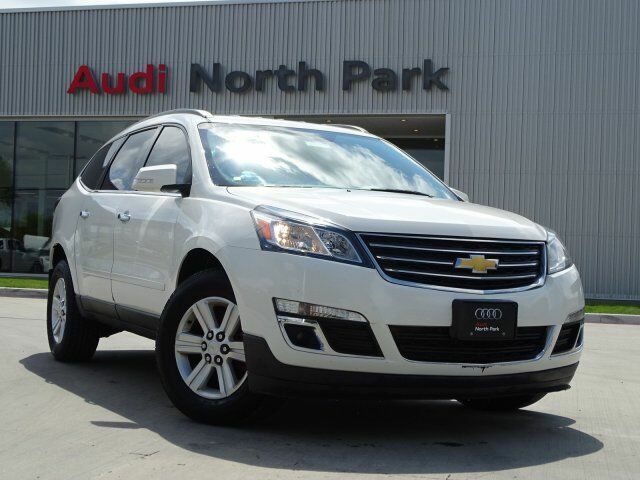 REDUCED FROM $14,995!, $900 below NADA Retail!, EPA 24 MPG Hwy/17 MPG City! Third Row Seat, Aluminum Wheels, iPod/MP3 Input, Captains Chairs, Back-Up Camera, Rear Air, ENGINE, 3.6L SIDI V6, TRANSMISSION, 6-SPEED AUTOMATIC AND MORE! Rear Air, Back-Up Camera, iPod/MP3 Input. Chevrolet LT with White exterior and Dk Titanium/Lt Titanium interior features a V6 Cylinder Engine with 281 HP at 6300 RPM*. SEATING, 7-PASSENGER (2-2-3 SEATING CONFIGURATION) with 2nd row flat-folding Captains Chair and third row 60/40 split flat folding bench seat, AUDIO SYSTEM, COLOR TOUCH AM/FM/SIRIUSXM/HD RADIO WITH CD PLAYER 6.5" diagonal touch-screen display (STD), TRANSMISSION, 6-SPEED AUTOMATIC, ENGINE, 3.6L SIDI V6 (281 hp [210 kW] @ 6300 rpm, 266 lb-ft of torque @ 3400 rpm [359.1 N-m]) (STD). Rear Spoiler, MP3 Player, Onboard Communications System, Aluminum Wheels, Keyless Entry, Privacy Glass, Steering Wheel Controls. Edmunds.com's review says "The 2014 Chevrolet Traverse features a spacious and attractive interior.". Reduced from $14,995. This Traverse is priced $900 below NADA Retail.